One of the many traffic-driving distractions Cam Newton had to ignore during his first semester back at Auburn? 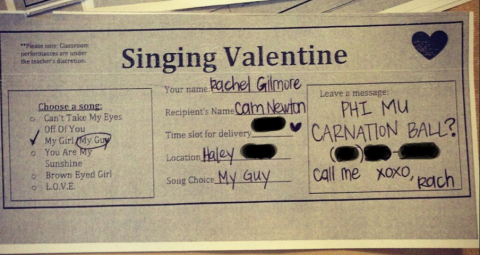 A Valentine’s Day invitation to Phi Mu’s carnation ball… delivered via song during class. Cam Newton’s hardest class during his surreal, serenaded first semester back at Auburn as a Normal College Student? Criminology. That’s what he recently told the Charlotte Observer (so maybe that was the grade he was hahaha willing to buy). Another challenge for the NFL Superstar student? The constant back-and-forthing between classes at Haley Center and voluntary workouts at Bank of America Stadium. Newton says he has one more semester before earning his sociology degree. Last month, we asked his mother Jackie Newton if he would walk to receive his diploma.